Your feet work hard for you! We tend to get our hair done, do our nails, pretty our faces, but we frequently ignore our feet! Let’s face it, without our feet how would we function the same as we do now? Our feet make life so much easier and they hold all of our weight as we use them to get us around! Our feet deserve the best comfort shoe and Therafit has the styles you love and the fit your feet love! Therafit has generously offered this giveaway. The participating Bloggers are here to help bring this giveaway to your attention! 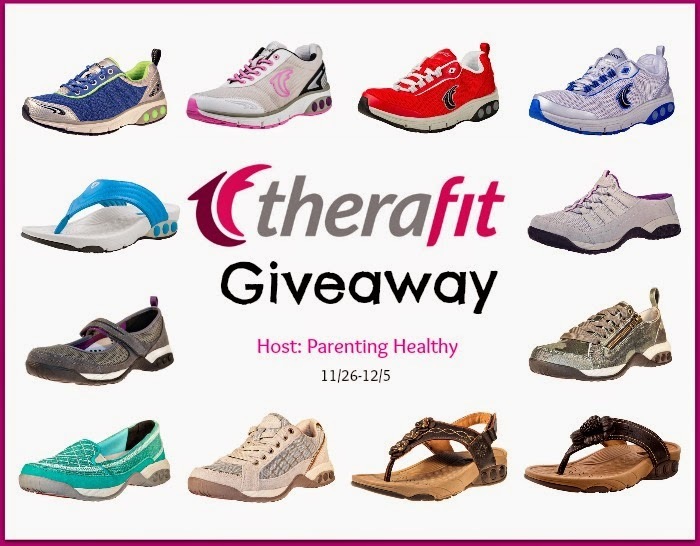 One (1) lucky reader will win a Therafit shoe of their choice! They are all women styles. Enter below. Open to US. Ends 12/5. Entry-FormDisclosure: Finger Click Saver and the participating Bloggers are not responsible for prize fulfillment. The event is organized by Parenting Healthy and AdvertiseWithBloggers and prize fulfillment is from the sponsor. My favorite pair of shoes are the Mary Jane shoes in Grey. I like the colors in the Deborah shoe. I am so impressed w this site & the shoes they offer. I have suffered from flat feet, over-pronation, and now I find I have Rheumatoid Arthritis, Lupus, and Ankylosing Spondylitis, besides being hearing impaired, diabetic, on and on…(:^) I have always searched for shoes that actually fit me, much less are “good” for my feet & their various pains. I could tell you stories from the time I had corrective shoes as a child, and how I just sent back the “guaranteed” comfort of 3-layer Doctor Scholls which felt like a bare wire mattress or something!! Anyway, I already love these folks—how could you not? Besides various giveaways (yea) and the fact that they champion for the hearing impaired, there is the tempting possibility that I might even be able to wear the shoes!!! Their diagrams & information make it sound possible!! I’m sorry to hear of your ailments. When one’s feet don’t feel you – your entire body feels like crap. My sister has polio and has had many similar issues like yours. I do hope you get to try them and if you do – please come back and let us know how they worked for you. I think my favorite is the Mary Jane Casual for Women. I love that one! I would love to have the Laura Women’s Casual Mule Slip On Black, it looks like a comfortable every day shoe. Alexa Women’s Sneaker Black/Citrus Green. The research I have done says that therafit are really good for walking. I like the Kate Women’s Sneaker Black/Silver. Thanks! Amazon Top 10 Lightning Deals 11/26/14 2014 Holiday Gift Guide Giveaway – 19 Amazing Prizes to be Won!